America’s Test Kitchen Farm-Fresh Cooking Sweepstakes – Win $1,000, a $1,500 Lodge Cast Iron gift card & more! Win $1,000 and much more! 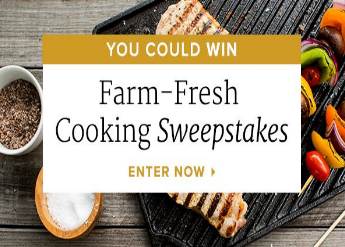 ENTER SWEEPSTAKES HERE – America’s Test Kitchen Farm-Fresh Cooking Sweepstakes page. ELIGIBILITY – The America’s Test Kitchen Farm-Fresh Cooking Sweepstakes is open to legal residents of the United States and the District of Columbia, 21 years of age and older at the time the promotion begins. SWEEPSTAKES ENTRY PERIOD – Promotion runs from March 13, 2018 (12:01 AM EST) to April 24, 2018 (11:59 PM EST). PRIZES – One (1) Grand Prize (ARV $5,259) including: $1,000 in cash, Lodge Cast Iron $1,500 Gift Card, Gardener’s Supply Company $1,500 Gift Card, 6 Month subscription to ButcherBox (ARV $1,020), 12-month membership to America’s Test Kitchen Online Cooking School (ARV $239.00). Three Runner-Up Prizes (ARV $1,010 each): each runner-up prize includes a Lodge Cast Iron $500 Gift Card and 3 Month subscription to ButcherBox (ARV $510).